The horned lark (Eremophila alpestris) that can be observed, if you're lucky, in stubbly open fields, though the lark blends so subtly into the landscape that you have to wait for movement to detect them. Finally, it is starting to feel like spring. The other morning, the light looked different and birds were suddenly out full-throttle. Recently returned tree swallows, phoebes, ruby-crowned kinglets, towhees were all trying their songs. As the snowflakes continue to mix in with the rain, one may forget that spring began several weeks ago. (Most also forget that February was practically spring, often hitting 70 degrees, rather alarmingly.) I remember the first day of spring this year, because of a particular flock of birds I saw, a sighting that I couldn’t help but read as fortuitous. By March 20, the snow in the cornfields behind my house had melted down to a hard, slick layer a couple of inches thick, easy to ski across. I was out on my skis, in the middle of the field, when I startled a group of birds that had been gathered on a muddy, bare expanse where the snow had melted away. I hadn’t seen them. They had been imperceptible amid the dry grass and corn stubble, but now they flew up with high-pitched, tinkling calls, and landed a short distance away in the nearest patch of mud. I guessed that they were horned larks. Not many other birds would be flocking in the middle of a cornfield. That morning, I had absentmindedly heard that spring began at 12:15 p.m., and for some reason it occurred to me to check the time right after I saw this flock. It was 12:16. A flock of larks bursting from the place where the mud had started to show through — melting, a sign of spring in itself — at the exact moment of the equinox. I’m not necessarily one to look for signs, but I couldn’t not take this as a good one. Larks are typically more associated with the Old World. When I was in Poland, I recall watching a skylark displaying over an open grassy area, in this case a coal ash impoundment that bordered my uncle’s farm. Birds congregated there. The impoundment was covered in grass, and dotted with ponds, a strata of ash comprising the banks. The skylark delivered on its name, staying aloft for long minutes, spiraling upward as it sang. 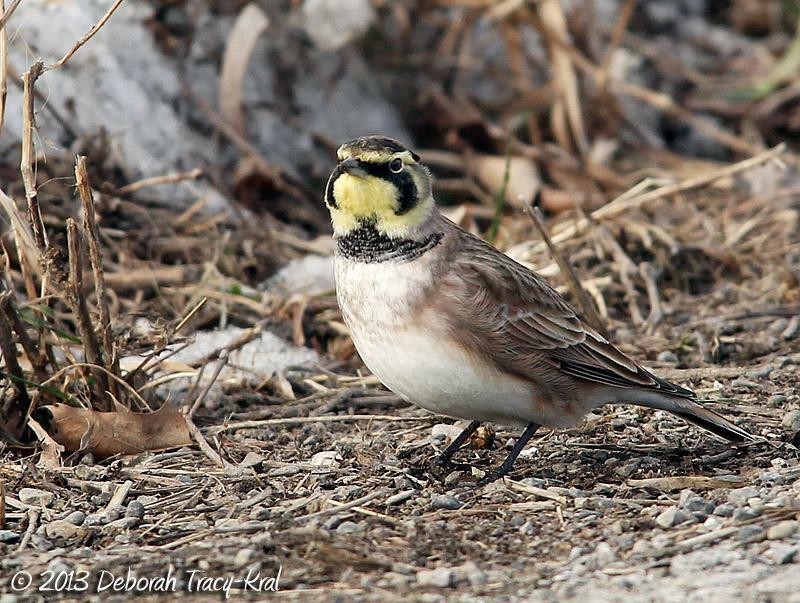 The horned lark is the only species of lark in North America, so named because of small tufts of black feathers that resemble miniature horns. But more noticeable are the bold black markings on the collar and sides of the face, giving a masked appearance. I saw these after I skied back to my house to grab binoculars, wanting to make sure they were indeed larks. I’d hoped they would still be there, and they were. They are far more apparent in the winter, when they gather in flocks. This small flock was around two dozen. However, it was nearly impossible to get an accurate count, though the birds were right there on bare ground. They were invisible until they moved, hunched brown blobs indeed the same color as the mud and grass, so it was impossible to see all of them at once. Had they alighted on the snow, it would have been a different story, but clearly, the melted patches they moved between provided the seeds and insects they wanted. I appreciate sightings like this, sudden bursts of movement and life amid a quieter landscape. Another day, I braked to a halt on the side of Route 7 between Sheffield and Canaan, intrigued by a large congregation of waterfowl in the Housatonic marshes. 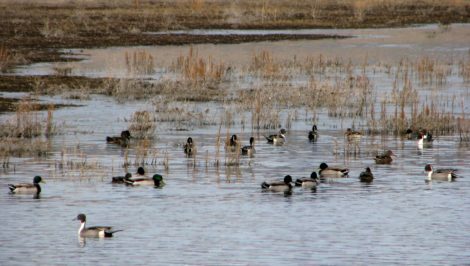 If there is open water, late winter and early spring is a good time to see ducks pausing on their migration north. While traffic rushed by, I held my binoculars steady to pick out not just the usual mallards and Canada geese, but many tiny, buffy, green-winged teal, and pintails — large ducks with brown heads and long white standout necks. Then, most exciting, I found a head patterned in emerald and white — a male American wigeon, sticking close by a female. 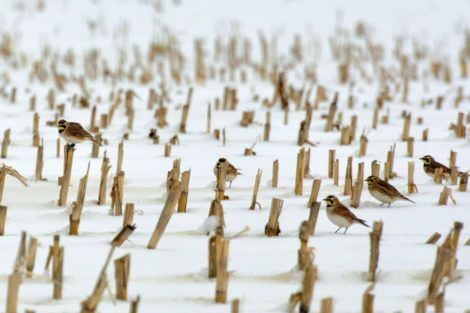 Did you see Snow buntings amidst the Larks? No, I wish! I didn’t see any this winter. 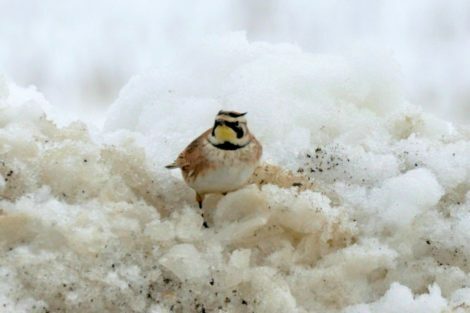 Clarification: As much as I’d like to take credit for that photo of the larks against the snow, it’s not mine. Maha Katnani was the photographer.